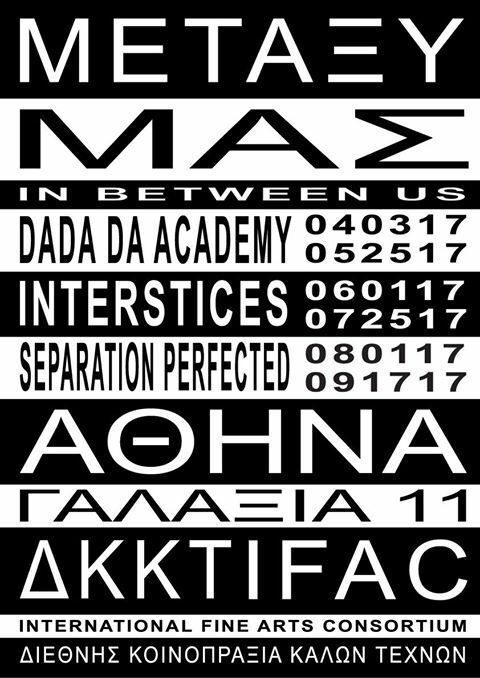 IFAC Arts proudly presents METAXY MAS (IN-BETWEEN US), a multi-platform curatorial ex-periment that brings together a diverse group of international artists and curators in Athens Greece. Coinciding with the 20th Anniversary of IFAC Arts and documenta 14 we open the premier exhibition on April 3rd with “Present” by DaDa Da Academy. Metaxy Mas encourages the viewer to read between the lines, beyond pastiche art world styles and discourses, to discuss the intertwined nature of perception, ideas, and knowledge in the supermodern era. Strongly rooted in painting, sculpture, and philosophy, the exhibition moves the participant forward into a dialogue to better understand the inherently problematic cycle be-tween tradition and innovation. Each of these positions manifests a different view regarding Pla-to’s becoming and being; again the place in between each of these poles of experience is metaxy. 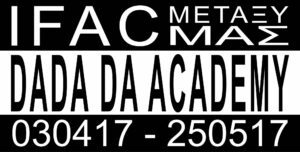 DaDa Da Academy is a traveling Academy with a strong amount of artistic freedom, consisting mainly by artists of the Athenian and Viennese avant-garde scene. The Academy’s foremost characteristics are improvisation, interactivity, and a flair for the unexpected. Their arbitrary lan-guage explores the different possibilities of the indefinite and elicits irreconcilably contradictory meanings. Founded by Panos Papadopoulos and Elisabeth Penker. Artists include: Antonakis, Tjorg Douglas Beer, Socrates Fatouros, Rui Miguel Leitao Ferreira, Vaggelis Hoursoglou, Lakis & Aris Ionas / The Callas, Georges Jacotey, Robert Jelinek, Albert Mayr, Panos Papadopoulos, Elisabeth Penker, Tula Plumi, Nana Sachini, Sofia Stevi, Sofia Touboura, Petros Touloudis, Amalia Vekri, Vincent Verhoef, Lee Wells and others. Project Room will launch ArtistsNetwork.net. [AN] is a online social club created to facilitate conversations about art, theory, and practice. More info on Chapters 2 and 3 to be announced soon. About IFAC Arts The International Fine Arts Consortium is an independent curatorial platform based in New York City and Athens Greece. Founded in 1996, IFAC is a semi-nomadic project space functioning in the real and virtual worlds through a broad based international network of artists, curators, and advisors to expand the dialogue in the arts and the avant garde. In 2015, we opened IFAC Athi-na to function as studio, laboratory, and ping pong practice space to add to the current arts dia-logue and create connections between Athens and New York City. Project Room is a modulating site for the presentation of new ideas through a schedule of events, screenings, performances, popups, field trips, calls to action, and other random happen-ings added both in and out of the gallery.